Following the Trans-Pacific Partnership (TPP) and Transatlantic Trade and Investment Partnership (TTIP), the demonstrations against investor-state arbitration and the wide discussion during the 2016 US presidential election, the climate surrounding foreign investment law is one of controversy and change, and with implications for human rights and environmental protection, foreign investment law has gained widespread public attention and visibility. Addressing the pressing need to examine foreign investment law in the context of public international law, the role of the multinational corporation in foreign investment and issues of liability for environmental and other damage, this new edition analyses contractual and treaty-based methods of investment protection and examines the effectiveness of bilateral and regional investment treaties. By offering thought-provoking analysis of the law in historical, political and economic contexts, this fully updated edition of Sornarajah's classic text captures leading trends and charts the possible course of future developments. 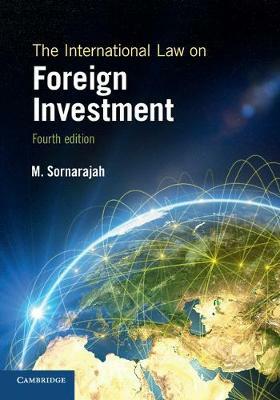 Suitable for postgraduate and undergraduate students, The International Law on Foreign Investment is essential reading for anyone specialising in the law of foreign investments.